KXIP vs SRH, IPL 2019 Live Streaming: Watch Kings XI Punjab vs Sunrisers Hyderabad live telecast for free in HD quality. The first phase of robbin-rounds matches of Indian Premier League 2019 or (IPL 2019) is about to complete as most of the IPL teams have already played first five matches. In today’s match or IPL’s 22nd match, Kings XI Punjab will lock horns with Sunrisers Hyderabad at IS Bindra Stadium. Both Sunrisers Hyderabad (SRH) or Kings XI Punjab (KXIP) have won three matches and 6 points right now. Before getting more details about live streaming, Start time, venue, updated time table and live score of today’s match, let’s take a look at Kolkata Knight Riders (KKR) vs Rajasthan Royals (RR) highlights. On April 7, Rajasthan Royal (RR) somehow managed to score 139 runs against Kolkata Knight Riders but KKR did not take much time to chase it. KKR chased down the low 140-run target in just 13.5 overs and won by 8 wickets. Kolkata Knight Riders (KKR) has once again earned their playback on the top of the IPL 2019 points table. Dinesh Kartik led KKR has won four out of five matches. 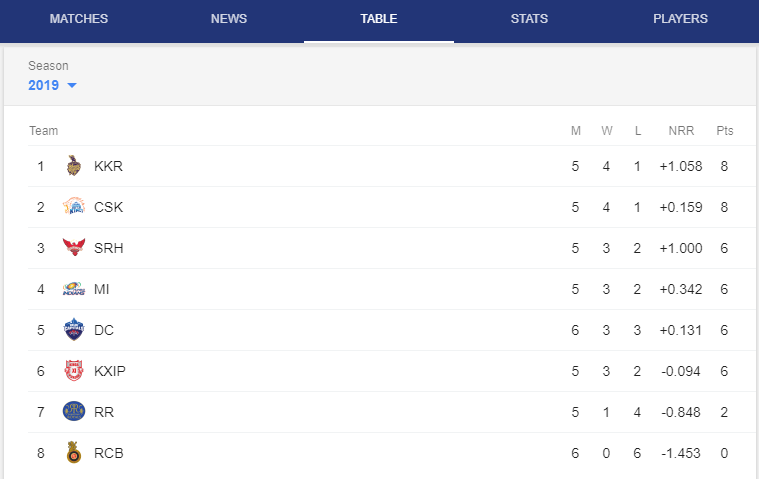 The second position in this IPL point table has been bagged by Chennai Super Kings and followed by Sunrisers Hyderabad, Mumbai Indian and Delhi Capitals. Kings XI Punjab to take on Sunrisers Hyderabad in the IPL 2019 match 22. It will be played at IS Bindra Stadium. The match between KXIP or SRH is scheduled to begin at 08:00 p.m (IST). The cricket lovers can watch the IPL match on TV Channels and online streaming on mobile for free. As we have earlier told you that Star Sports holds the telecast rights of IPL 2019 and will broadcast the match live across its network. The live streaming online of IPL 2019 will be available on Hotstar app and website. Notably, the online live streaming of Today’s IPL cricket match will be available on Hotstar app and website. Fans can click here, for RCB vs DC live score updates.